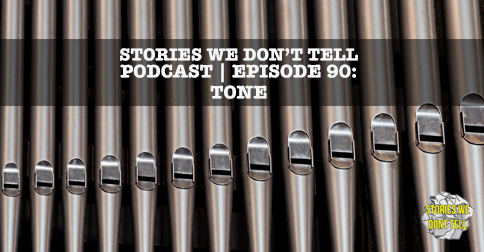 This is a transcript of the Stories We Don’t Tell Podcast, Episode 90: Tone. So we are in our second episode of this new season and it's also the second episode in the series of Five in Five: After Dark. The topic today is tone. We mean the way the story is written. For example, a lot of the stories that I write have a sort of earnest, struggling kind of tone. Some of our favourite storytellers have vastly different tones. Storytellers and writers will develop a tone that they feel most comfortable with. Click on the image to listen to Episode 90 of the podcast. I intentionally changed my tone. I was telling a lot of stories that were just kind of sad and I didn’t think I needed to drag everybody through this anymore. I started telling stories that were a little bit funnier. I just really kind of enjoyed getting those laughs from the audience. I started thinking this is great and you can keep repeating this. Once you find the kind of tone that works for your writing voice and storytelling voice, you can then just replicate that forever. But you can also kind of get bored with it after a while. Bored and stuck. I think for me there was a certain number of stories I could tell and the tone that I generally take it which is just sort of not super dark, self effacing, breaking the fourth wall kind of thing. You can only get so far when telling stories from the same tone. Some stories are impossible to tell with a particular tone or at least very difficult to tell that particular story. And so if you don't start challenging yourself to break out of the tone, you limit the number of stories you could be effectively telling because you're stuck. Yeah. For me personally what I'm really interested in at the moment and the challenge for me is that I now want to switch things up again. I don't know if I want to go back to telling more serious stories. I do want to tell more stories that have a little bit more depth to them, but I'm kind of interested in mixing the two up. I have this real heavy story that I want to tell. Then try to find the humour in it or that you can have a little bit more levity to it. The challenge this week is taking a story that you've already written and change the tone to the opposite tone or as far away from that original one as possible. It could be something that you wrote angry and now you want to write sarcastic. Try to change the voice and write the whole story out in that in that new voice. It's great practice but also it hopefully will maybe give you a couple little pieces that you can bring into that original story you're working on or a funny way to merge the two and give yourself sort of a better overarching piece. Subscribe to the Stories We Don’t Tell Podcast on iTunes.